A powerhouse team of religious, civic and business leaders will travel to Rome in March to plan for the World Meeting of Families in Philadelphia next year. 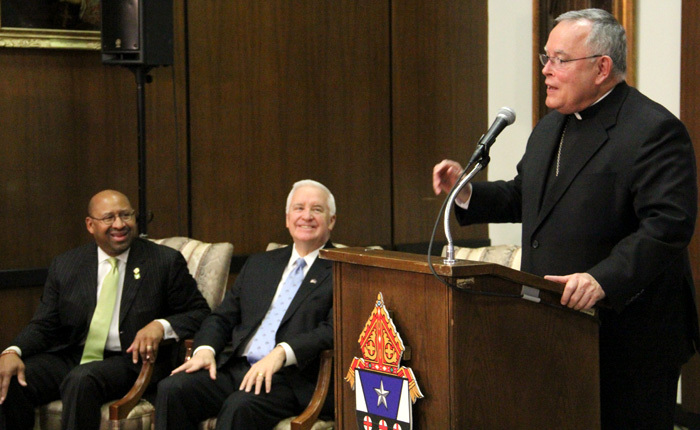 Archbishop Charles Chaput led a press conference with Pennsylvania Governor Tom Corbett and Philadelphia Mayor Michael Nutter March 7 at the Archdiocesan Pastoral Center to announce they will lead a delegation March 24-26 to meet with Vatican officials to plan the international event. They will also have an audience with Pope Francis. Throughout the press conference speakers told of their confidence that the pope will visit Philadelphia in September 2015 and vowed to personally convince him to make his first pastoral visit in North America to the city for the conclusion of the eighth World Meeting of Families. 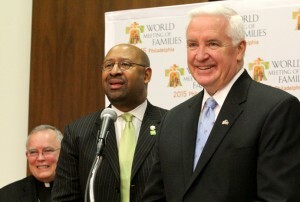 “I plan to extend to the holy father a warm, vigorous and hopefully very persuasive invitation to visit our state next year,” said Corbett, who added Nutter and other members of the delegation would also “sell” the pope and Vatican officials on making a papal visit. “It’s only in Philadelphia that folks talk about trying to ‘seal the deal’ with the pope,” Nutter quipped. Archbishop Chaput announced members of the leadership team planning the World Meeting of Families event, and they include some of the heaviest hitters in Philadelphia’s civic and business spheres. Corbett said he expected perhaps 1 million visitors if Pope Francis celebrates the public Mass on Sept. 27, 2015, the concluding day of the event. The most recent such meeting in Milan, Italy in 2012 drew 1 million to that city. Although Comcast’s Roberts and Cohen will not attend the meeting at the Vatican later in March, the other members and Archbishop Chaput, Corbett and Nutter will begin meetings March 25 with Vatican officials to plan logistics for the Philadelphia event. Representatives of the Pontifical Council for the Family, which sponsors the World Meeting of Families every three years in a different city and of which Archbishop Chaput is a recently named member, will meet with the delegation March 25. Later in the day a press conference in Rome will include the archbishop and Archbishop Vincenzo Paglia, president of the council. The following day the delegation will have an audience with Pope Francis, who was clearly on the members’ minds at the Philadelphia press conference. Whether 1 million or 2 million people attend, “we want people to come. We will do whatever we have to do to make this a very successful and great event here in Philadelphia. You can take that to the bank,” he said. As excited as the interested Catholics in the audience were about the prospect of the pope attending the event next year, Archbishop Chaput kept the focus on family life. The World Meeting of Families “has the power to transform in deeply positive ways not just the spirit of Catholic life in our region but our entire community,” he said.